Nokia has recently launched its much-anticipated phone Nokia N8 in India. 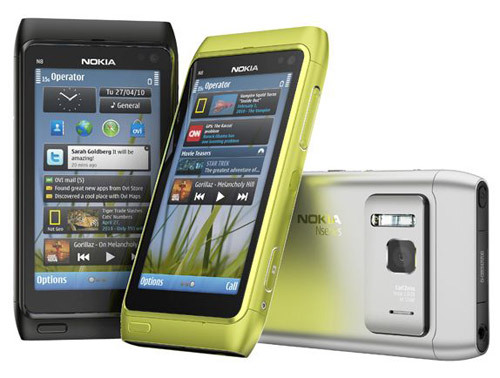 It is the first mobile phone by Nokia which is powered by Symbian^3 platform. Nokia N8 is feature rich phone. the main features of the phone are 12 Megapixel camera with Carl Zeiss optics and HDMI connector. The phone is not only best in feature, it also has a great design with dimensions 113.5 x 59 x 12.9 mm. The phone has a screen size of 3.5″ with resolution 16:9 (640×360 pixels) and 16.7 million colors. The display is capacitive touch screen. It has some additional features like Orientation sensor (Accelerometer), Compass (Magnetometer), Proximity sensor and Ambient light detector. Nokia N8 has up to 3 customizable home screens. Nokia N8 supports a 12 Megapixel camera with Carl Zeiss optics so you can capture great images. You can capture great images even at night as the phones comes with Xenon flash that allows you to take good pictures in low-light conditions as well. The secondary VGA camera (640×480 pixels) of the phone is used to make video calls while you are in 3G networks. the main camera of the phone is best to capture both still pictures as well as to record videos. You can capture HD quality 720p resolution video. The camera supports up to 2x digital zoom for still images and up to 3x digital zoom for video. The phone is capable of storing enough data with 16 GB internal memory which is expandable up to 32 GB with MicroSD memory card slot. There are multiple connectivity options available in Nokia N8. The connectivity options are Bluetooth 3.0, HDMI port, 3.5 mm AV connector, High-Speed USB 2.0, USB On-the-Go. You can surf your favorite web pages with Wi-Fi, GPRS/EDGE, HSDPA. The phone provides you full browsing experience of real web pages with touch control panel. you can stay updated with your favorite web sites with in-built RSS reader. The Nokia N8 is available at Rs.26,259 at all Nokia Priority Stores. hey its really really cool.but nokia should start using android. Looks cool .But the price is too high I am looking to buy one.Is it available anywhere below 23000 ? Can you tell us Sourish why you feel that the software of N8 is not good ? I mean is there any specific reason behind it ? I checked N8 out at the Nokia store last night. Looks wise it is stunning. But the software / OS seems to be a bit boring. Its ok if you have not seen or used Android or iPhone, but once you see iphone or HTC or Samsung android phones, N8 pales in front of them. I think Nokia mobile phones are losing their popularity in India among users. fantastic review. like my n8. fantastic unlocked cell phones. itâ€™s light feels fantastic, simple to manuever. processor is much quicker, like it. web browser and wifi are fantastic for my business, helps me keep in touch with my clients. my wife likes hers for the fun of it, facebook games apps, keep us busy and pleased! recorder is fantastic. much better than my ancient unlocked blackberry phones. speaker phone is loud and itâ€™s really simple to email and text for being a touch screen. also got our blackberry unlocking and cell phone unlock codes for free! got our last couple n8â€²s at unlockthatphone.com very pleased so far. I am planning of buying one. That’s great Bimal. Don’t forget to share your reviews about this mobile phone after you purchase it.